When a fellow video game designer asked me, what a futuristic energy weapon could look like, I built this model! More pictures and videos here! This is the circuit behind the coilgun electronics built into the model. These electronics simulate a coilgun and add to the futuristic theme with their distinctive charging sound and energetic nature. A real coilgun is basically a electromagnetic linear accelerator. I used a toygun's hull and modded a coilgun inside. As you can see, the copper coil is placed in the center and the electronics are fit inside an extension at the front. The capacitor is hidden inside the model's grip. It's capacity is 800 yF at 300V. 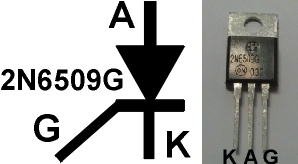 The semiconducter I used is a 2N6509. I added a switch to the trigger. Pulling the trigger will discharge the capacitor and create a magnetic pulse which in theory accelerates small pieces of metal. The distinctive and fascinating sound of charging and discharging the capacitor adds another level of realism to the futuristic theme. The kinetic energy of the real circuit is under 0,08 Joule. Additionally I modified the reloading mechanism. Pulling back the slide will place a metal projectile in front of the coil. This model looks like something straight out of a video game. Designing something futuristic one must allways try to use technology that already exists. The next step is imagining what could be possible with parts and components that are lighter, smaller and more powerful. Take all of this into account and you'll end up with a realistic but futuristic piece of technology. Here are more of my models and designs.